Congratulations to Costin who wins the $20 Starbucks gift. Is is tooth # 9, or in other words the (patient’s) left upper central incisor. This is a great result, that required time and an inter-disciplinary approach to providing treatment, we worked with our friend Nicolas Ravon, DDS, periodontist specialist. 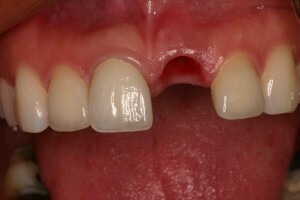 You may share these pictures and should anybody you know need dental implants treatments, please keep us in mind.